I love how they put the "Do not move" sign on like it can go anywhere! People nowadays need to be told everything ! ^^True, true. The dumbing down of the world. I put a frozen pizza in the oven the other night @400 degrees. I told my husband I can not believe the directions actually say "do no remove with bare hands"
It's all about liability too. Sad. Exactly. Somebody could rupture a disc thinking that it could be moved. Kinda like the lady that sued McDonalds because her coffee burnt her, so they had to start making it say "caution hot" in bigger type. You can move the engine anywhere you like. Just don't move the sign or you'll be in for the high jump. That court case was fully justified. Round 3: Back for more! If I were the McDonalds lawyer I would have asked. "So Mrs. Liebeck why didn't you just wait until you arrived home and had a cup of coffee? Maybe you should have ordered a cold drink instead? We all know the combination of precariously balancing hot beverages in ones' lap, especially while in a vehicle... But where not here to teach you common sense are we. We're here because you must have been whacked out on crack?? Don't play the innocent old lady card either Mrs. Liebeck... or should I call you Emelda Perez the infamous Mexican Cocaine Queen and murderer!?" I'd have liked to see the judge's interpretation of that defence! 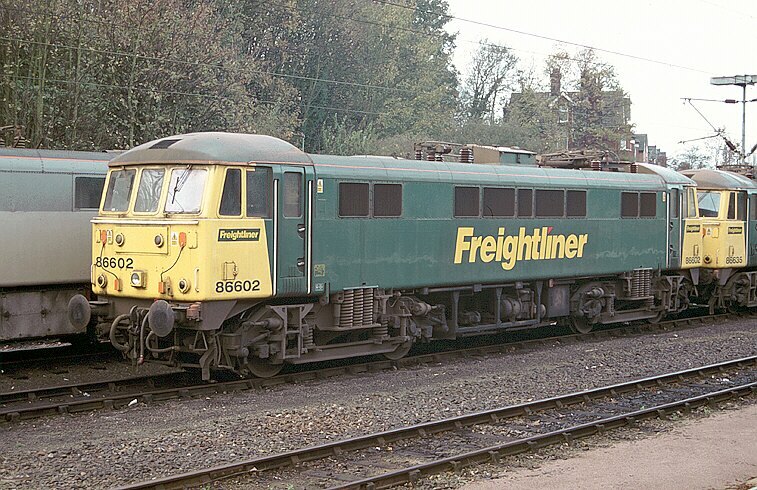 It looks a bit like a Brush type 4, but its an electric Class 86! In fact, THIS one! You will, of course want to know that it was previously 86002, and before that, E3170. Out-anoraked, I think. As there are no overhead power lines, it wouldn't have moved far anyways! ^ it was also, for a brief time, 86402. McDonalds had burnt HUNDREDS of folks prior to this case. They served their coffee well above industry standards. Something to the affect of 30 degrees OVER acceptable industry standards for hot liquid. This coffee prior to the settlement wasn't just 'hot'. It was so hot that indicental contact with skin would result in 2nd-3rd degree burns within .5 seconds. It would seem to me, that a company that willfully ignored hundreds of complaints, was out of compliance with industry standards, should be held accountable. Incidently, prior to going to court, the plaintiff (old lady) had simply requested that McDonalds pay her medical claims (less than $20,000). They refused, and instead went to court where they lost. And should have. Not every case is 'outrageous', but McDonalds did a good job spinning it their way. Yep. Some dingbat spilled hot coffee on herself. Just don't care. I've had a diesel drum explode next to me. Admittedly it wasn't McDonald's fault. I spilled some red hot Starbucks cofee down me ... that was a year ago and I've still got the burn marks to prove it! Just how do you get those nailed down f***ing lids off? For Jay ... passed through Euston yesterday saw one of those signs on a train occupying the whole of the railed part of platform 6 ..... (was on the 07:50 from Birmingham then the 18:23 Euston to Wolverhampton). Hey do you get more money for driving a full train on a weekday as opposed to driving a half empty train just because it's a Sunday? ... If you think that's a daft question go ask a checkout operator that is forced to work a Sunday shift and where the shop is jampacked with niggly customers throughout the day. When we used to do Birmingham New Street to Glasgow via Manchester (Which was transferred to Cross Country, who lost it to Transpennine Express after a week LOL!) We used to have this guard that would make the annoucements err special and he once annouced Preston like 5-6 times in a go. Someone on Youtube recorded his annoucements. I've personally never worked with this legend but know others who have. And finally, I was at work when this happend, It was a ball ache getting to the trains! The station east of Hastings is Ore, so the train announcements always sound vague and incomplete. "Calling at Bexhill on Sea, St Leonards on Sea, Hastings, and Ore."
thats what they want you to think, i guess you haven't heard of McDonalds attempts to destory all diesel so they can steal it to sell in their burgers? I was on a commuter train out of Boston, and when we approached Billerica, the conductor called out, "Beautiful downtown Billllll-er-ricker!" (For those who think it should be "Bill-AIR-icka" - the proper pronunciation is "Bill-a-RICK-er."